For information about Hawaiian volcanoes, a good place to start is the U.S. Geological Survey. Between its websites and publications, abundant resources are at your disposal. Perhaps the best place to begin your search is the USGS Hawaiian Volcano Observatory website. Many readers are likely familiar with this website, but for those who are not, here’s a brief overview. 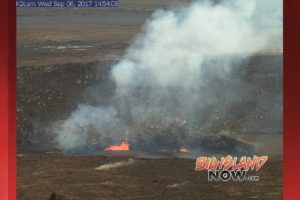 The most frequently visited HVO webpages include the daily updates for Kīlauea and weekly updates for Mauna Loa, photos and maps of Kīlauea Volcano’s ongoing lava flow, and webcams images, especially those of Kīlauea’s summit lava lake. Maps showing recent earthquakes in Hawaiʻi, including location, magnitude, and other details, and air quality data are often visited, particularly in the wake of a felt quake or perceptible vog (volcanic air pollution). But the HVO website offers much more: You can read about volcanic and earthquake hazards in Hawaiʻi and learn about the tools and techniques used by USGS scientists to monitor active volcanoes. 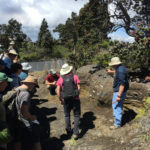 Geologic histories, monitoring data, and links to publications are provided for Kīlauea, Mauna Loa, and other Hawaiian volcanoes. 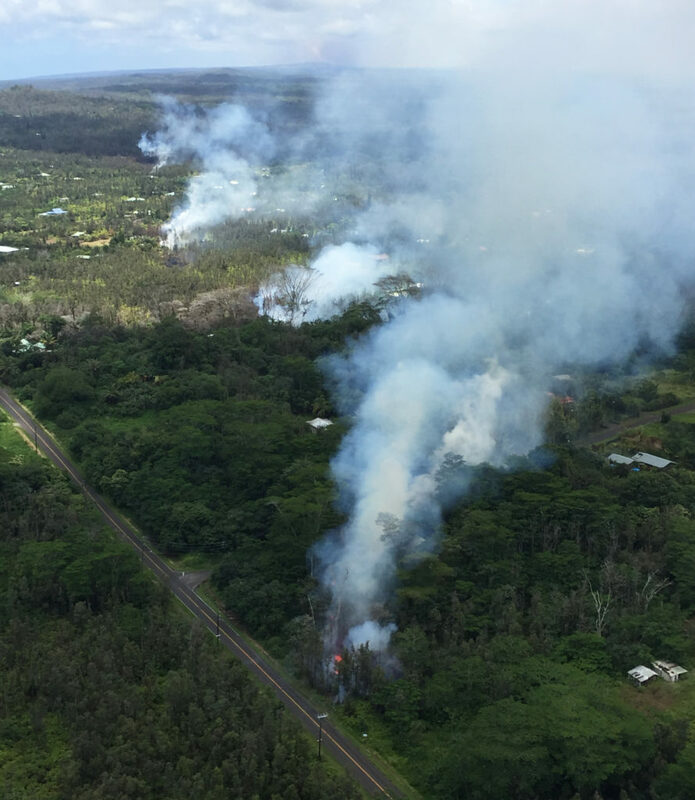 You can find answers to “Frequently Asked Questions” about volcanic gas emissions, vog, lava-flow hazard zones, and the current Mauna Loa unrest. 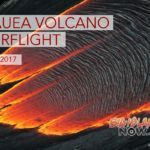 Photos and Volcano Watch articles from past years can also be accessed through archive searches. So, if you haven’t visited HVO’s website in recent months, we encourage you to do so. It has a new look and expanded offerings—and new features will be added in the months and years ahead. USGS publications are numerous and varied, and many are now available online. The current USGS series includes Fact Sheets, General Information Products, Data Series, Scientific Investigations Maps, and Professional Papers, among other publications. Some of the USGS publications about Hawaiian volcanoes, all of which can be freely downloaded, are described below. USGS Fact Sheets cover topics clearly and concisely, often in 2-4 pages. The newest Fact Sheet especially relevant to island residents is “Volcanic air pollution hazards in Hawaii” (FS2017-3017). Others address Kīlauea Volcano’s ongoing East Rift Zone (Pu‘u ‘Ō‘ō) and summit (Halemaʻumaʻu) eruptions, the history and hazards of Mauna Loa, earthquakes in Hawaiʻi, and Kīlauea’s explosive past. USGS General Interest Products are written specifically to focus on scientific information of public interest. “Eruptions of Hawaiian Volcanoes—Past, Present, and Future” (GIP117) and “The Story of the Hawaiian Volcano Observatory—A Remarkable First 100 Years” (GIP135) are two such publications that have been well-received in Hawaiʻi. Since 2004, HVO has used time-lapse cameras and webcams for visual monitoring and research. 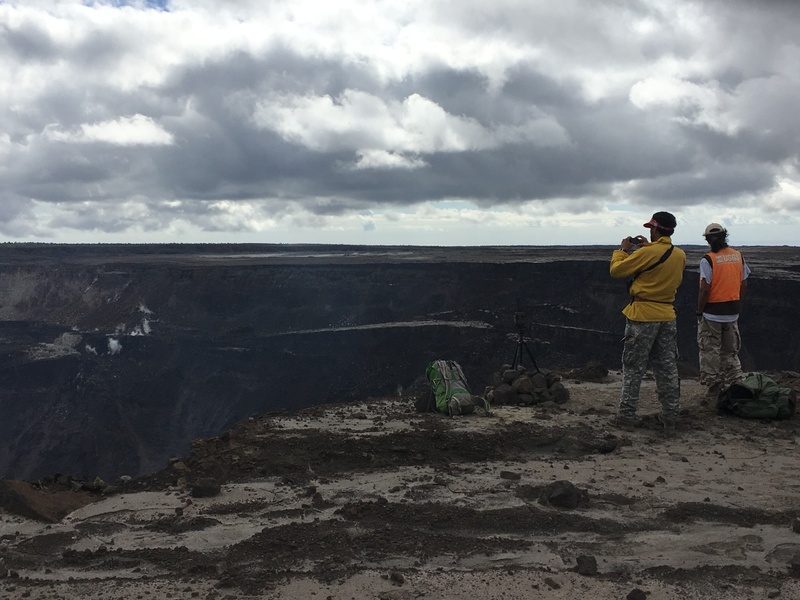 The USGS Data Series (DS621) publication, “Selected Time-Lapse Movies of the East Rift Zone Eruption of Kīlauea Volcano, 2004-2008,” showcases 26 time-lapse movies from the collection of images acquired during the camera systems’ first four years. Another USGS Data Series (DS144) is the digital database for the “Geologic map of the Island of Hawaiʻi.” This map was published as a USGS Miscellaneous Investigations Series (IMAP 2524-A) in 1996. In 2007, the “Geologic Map of the State of Hawaiʻi” was published as a USGS Open File Report (OFR 2007-1089). It includes eight plates (PDF files) showing the geology of the main Hawaiian Islands. The “Geologic map of the northeast flank of Mauna Loa volcano” was recently published as a USGS Scientific Investigations Map (SIM 2932-A). Four additional maps for this massive volcano are in progress. If you’re interested in making maps yourself, “GIS shapefiles for Kīlauea’s episode 61g lava flow, Pu‘u ‘Ō‘ō eruption: May 2016 to May 2017” is now available through a recent USGS data release. This dataset contains shapefiles and associated metadata for the 61g lava flow through May 31. Links to the USGS publications noted above—as well as many other books, databases, journal articles, and professional papers about Hawaiian volcanoes and earthquakes—are listed on HVO’s website. But that list is just the tip of the iceberg. More than 150,000 publications written by USGS scientists on wide-ranging topics of geologic interest can be accessed though the USGS Publications Warehouse (https://pubs.er.usgs.gov/), including those focused on volcanic and seismic activity in Hawaiʻi. A comprehensive bibliography on Hawaii geology, including USGS publications, can also be found here. 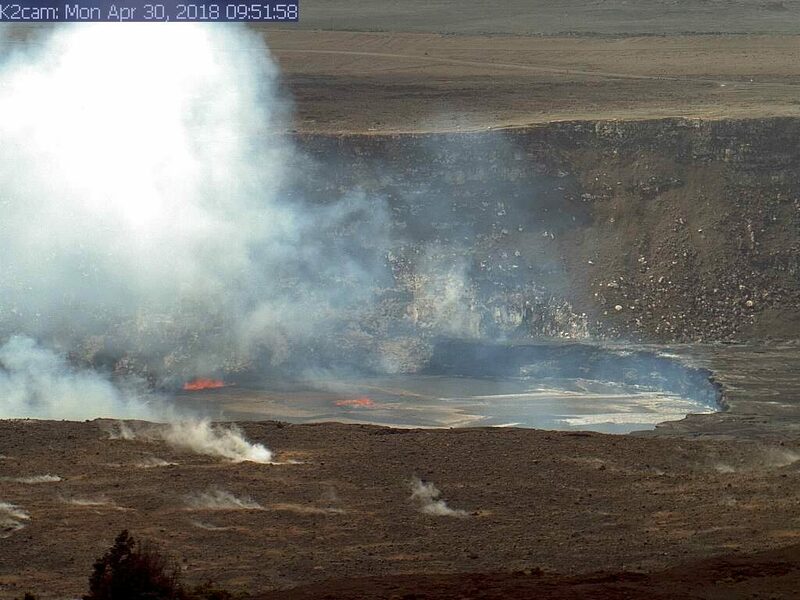 Photo caption: A USGS Hawaiian Volcano Observatory webcam captured this image of spattering on Kīlauea Volcano’s summit lava lake on September 6, 2017. In concert with summit inflation, the lake level had risen to 54 ft below the vent rim, bringing it into view from the Jaggar Museum Overlook in Hawaiʻi Volcanoes National Park. When inflation switched to deflation the next day, the lava lake level dropped about 49 ft. HVO webcam images of Kīlauea can be viewed here. This past week, Kīlauea Volcano’s summit lava lake level fluctuated in concert with summit inflation and deflation, ranging about 54–103 ft below the vent rim. On the East Rift Zone, the 61g flow remained active, with lava entering the ocean near Kamokuna and surface breakouts downslope of Pu‘u ‘Ō‘ō. Widening cracks and slumping on the Kamokuna lava delta indicate its instability and potential for collapse. The 61g flows do not pose an immediate threat to nearby communities. Mauna Loa is not erupting. During the past week, small-magnitude earthquakes continued to occur beneath the summit caldera and upper Southwest Rift Zone, primarily at depths less than 3 miles, with some additional deeper events (3–8 mi). GPS measurements continue to show deformation related to inflation of a magma reservoir beneath the summit and upper Southwest Rift Zone. No significant changes in volcanic gas emissions were measured. Two earthquakes with three or more felt reports occurred on the Island of Hawaiʻi during the past week: On Sept. 6, at 1:40 a.m. HST, a magnitude-3.3 earthquake southwest of Pepeekeo at 19 mi depth. On Sept. 1, at 5:12 a.m. HST, a magnitude-2.6 earthquake northeast of Hawaiian Ocean View at 3 mi depth. VOLCANO WATCH: Tephra Deposit Names: Out With the Old, in With the New!